PPHS senior Teagan Hay attempts a shot during the first half of the Lady Knights’ 2-0 setback to Williamstown on Tuesday at the Shawnee Sports Complex in Dunbar, W.Va.
DUNBAR, W.Va. — A bittersweet ending to a trilogy for the Lady Knights. 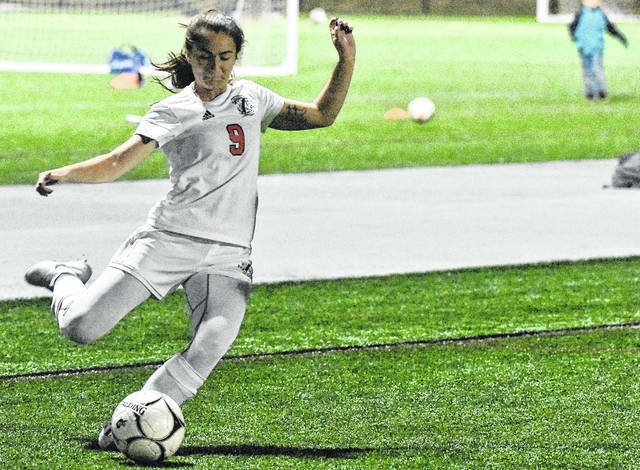 The Point Pleasant girls soccer team suffered a 2-0 setback to Williamstown in the Class AA/A Region IV Section 1 tournament on Tuesday at the Shawnee Sports Complex in Kanawha County, as the Lady Knights suffered their third defeat to the Lady YellowJackets this season. Point Pleasant (10-7-4) fell behind 1-0 when WHS junior Lilly McMullen shot found the back of the net in the 16th minute of the contest. Both teams were held without a goal for the remaining 23:35 seconds of the half, as WHS carried a one-goal advantage into the intermission. Following the break, the two squads remained separated by a single-point, until Williamstown freshman Emma Berman scored on an assist from McCullen in the 70th minute of the game to extend the Lady Yellow Jackets lead to 2-0. The two teams were each held scoreless in the remaining 9:39 of the contest, as WHS closed out the two-goal match victory. The Lady YellowJackets outshot the Lady Knights by a sizable 11-4 overall margin, as PPHS finished with a 5-1 edge in corner kicks. Point Pleasant junior goalkeeper Monica Cook finished with nine saves, while WHS junior Mara Rinehart finished with four saves. Both teams were whistled for four fouls apiece, as PPHS received the lone yellow card in the contest. Following the victory, sixth-year PPHS head coach Chris Errett was candid when discussing his team’s effort both in the game and throughout the 2018 campaign. “We played tough for a full 80 minutes,” Errett said. “We just made too many mistakes at the back and just gave them far too many chances. We had our opportunities to get goals, we just didn’t cash in on them. They did well with their chances. I just wish we could’ve done better with ours. The match was the final contest for Point Pleasant seniors Peyton Campbell, Bailey Thomas and Lexi Watkins-Lovejoy. The setback for PPHS was the third shutout lose to Williamstown of the 2018 campaign, as WHS also had a pair of victories over the Lady Knights in the regular season, winning 1-0 on Aug. 23 in Wood County, and 2-0 on Oct. 6 in Mason County.